Motorola's officially not pulling any punches, with a full-page Droid X ad in the NY Times today making it clear that their phone don't need no stinking bumper. If their last ad was a jab, this one's a full-on haymaker. At Motorola, we believe a customer shouldn't have to dress up their phone for it to work properly. That's why the DROID X comes with a dual antenna design. 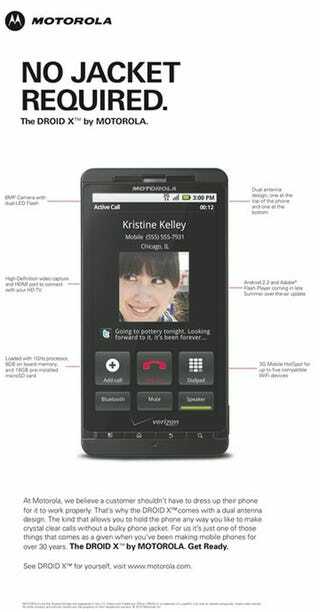 The kind that allows you to hold the phone any way you like to make crystal clear calls without a bulky phone jacket. For us it's just one of those things that comes as a given when you've been making mobile phones for over 30 years. Obviously, there are a few not nice things you could say about Droid X as well. But after Apple called out Droid X specifically in the Antennagate aftermath, it's only fair that Motorola has a chance to respond. And do they ever!